The Transportation Industry is growing and there is a high demand for well-trained drivers. This eight-week course utilizes state-of-the-art simulator training, classroom instruction, range and road driving, and practical application of skills used in the operation of a tractor-trailer. Students who successfully complete the entire course will receive a class "A" Commercial Driver License (CDL), a certificate of completion, and be qualified to secure an entry-level job as a Commercial Motor Vehicle driver. The course meets all Federal Motor Carrier Safety Administration guidelines. Amarillo College is not an employment agency, nor do we guarantee the Texas Department of Public Safety will issue a license. 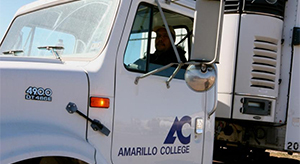 Students will have ample training, opportunity and assistance to talk with visiting recruiters, apply for employment, and pass the DPS written and skills tests with an Amarillo College vehicle. Fees, books and expenses are not included in the cost of the course. For additional information please call 806-335-4370. The Commercial Driver License Program is also available as an Academic course with 16 hours of college credit. Visit here for more information. Employment for heavy and tractor-trailer truck drivers is projected to grow 21 percent from 2010 to 2020, faster than the average for all occupations. As the economy grows, the demand for goods will increase, and more truck drivers will be needed to keep supply chains moving.